As Britons look to last-minute breaks before autumn kicks in, expect lots of escapes to well-worn European destinations with low-cost airline connections. Yes, Spain is calling. The long-awaited start of the summer holidays is expected this week with the travel industry bracing itself for a surge in bookings after the Olympics. With the Games having captured the public’s imagination, many Britons are taking their holidays later than usual. Two years ago there was a similar exodus when England was knocked out of the World Cup. British Airways sought to capitalise on the mood encouraging passengers to stay at home and enjoy what has turned out to be a glut of gold medals. 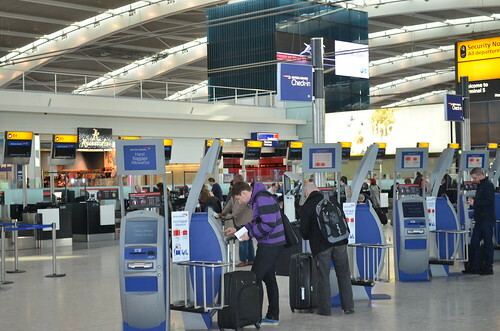 London’s Heathrow Terminal 5. Photo by eGuide Travel. The airline is now pushing holidaymakers to enjoy what it described as a “sizzling September” with offers including £100 off European holidays. The first sign of the delayed great British exodus will be at Heathrow, which expects to deal with 116,000 departures tomorrow, compared with 95,000 on an average day. While the numbers are initially being swelled by departing athletes, families and supporters, daily departures from Heathrow will hover around 110,000 for the rest of the week. According to research carried out by the price comparison website, Travelsupermarket, more than 3million Britons have delayed their holiday because of the Olympics. “By mid-August we’d expect most people to have booked their annual summer holiday or at the very least have something booked,” said Bob Atkinson, the company’s travel analyst. Laurence Hicks, director of tour operator and holiday rentals company CLC Leisure, has noticed a similar trend. “The end of July and beginning of August were relatively quiet but suddenly we have seen this massive upswing in booking and inquiries. “Either we Brits don’t want the party to end and intend to carry on celebrating the success of Team GB with a holiday or we are worn out by the emotional extremes of watching the Games and need a break. EasyJet has already noticed a surge, with nearly 200,000 passengers booked to depart tomorrow, with Athens and Alicante the most popular destinations. Eurostar is also expecting a busy week with Britons crossing the Channel in droves for their delayed summer break. According one aviation industry insider, airlines have had a slack summer and will be looking for a pick up in post Olympics departure to fill empty seats.